Fall is my favorite season, and not just because it marks the beginning of so many great seasonal sports like hockey, basketball and football. I love it because it also means the Compete Sports Diversity Awards are almost here. It is hard to believe that our diversity awards sprang from such humble beginnings. In 2010 Olympic gold medal diver Greg Lou- ganis hosted a small event for Compete honoring our 2010 Athlete of the Year, swimmer Michael Holtz. Beginning with that intimate presentation, the Compete Sports Diversity Awards have grown into an annual event that honors the best in sports diversity. Counting that very first event hosted by Louganis, 2015 now marks the sixth year of the Compete Sports Diversity Awards. Past award winners have included rugby star Ben Cohen, bas- ketball icon Jason Collins, soccer star Robbie Rogers, NFL player Esera Tuaolo, pro golfer Sue Wieger, the Los Angeles Dodgers, the Phoenix Mercury, the University of California at Los Angeles, Ari- zona State University and many more. 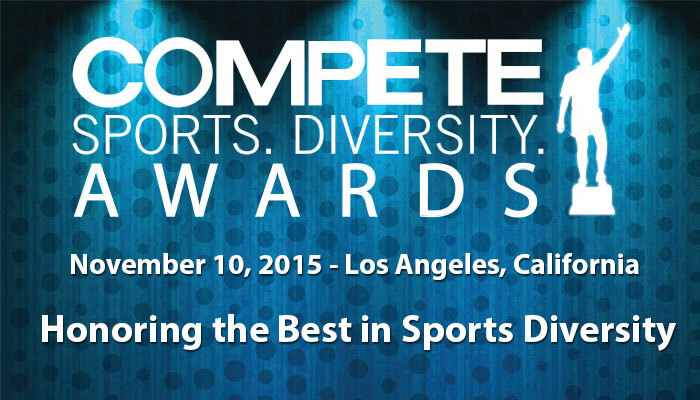 On November 10, this year’s Compete Sports Diversity Awards will be back in Los Angeles to honor sports diversity awardees in such categories as the Legacy Award, the Inspiring Athlete Award, the Corporate Diversity Award, the Mark Bingham Athlete of the Year Award and more. It hardly seems possible that it is just over a month away. I hope you will join us on November 10 in Los Angeles for an evening of good food, lots of fun and the opportunity to honor so many deserving athletes and organizations. You can find out more by visiting www.sportsdiversityawards.com. Oh, and don’t forget, fall is also about football.